Read it carefully. I've gotten a hold on "E Zed"'s email and I have been in contact with him. Long story short, he'll be going back there soon with friends, armed. 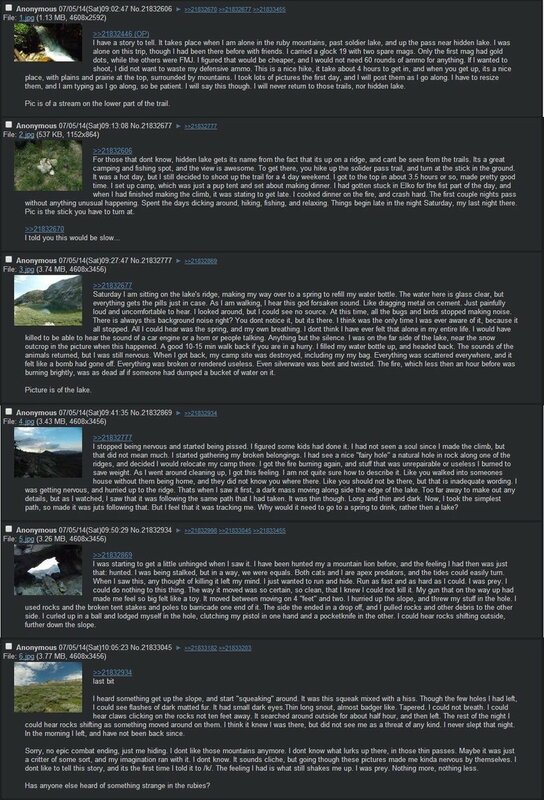 In this thread on 4chan, there's some more info. Including more stories about similar creatures in the same place in Nevada. I'll link them here. Both of these stories describe a similar feeling of dread and anxiety. And they seem to describe some kind of bipedal creature. The only exception is that in the second story the creature seems more reptilian in appearance. In this 4chan thread I made, we've been trying to find the area where E Zed went to. When I emailed him he said he and his dad felt like they knew where it was. So we may be making a discovery very soon. North Elko county Nevada Recommendations?